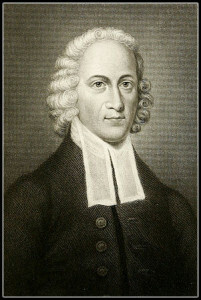 Jonathan Edwards (1703–1758) was a preacher, theologian, and missionary to Native Americans. Edwards “is widely acknowledged to be America’s most important and original philosophical theologian,” and one of America’s greatest intellectuals. Edwards’s theological work is very broad in scope, but he is often associated with his defense of Reformed theology, the metaphysics of theological determinism, and the Puritan heritage. Recent studies have emphasized how thoroughly Edwards grounded his life’s work on conceptions of beauty, harmony, and ethical fittingness, and how central The Enlightenment was to his mindset. An excellent biography of Jonathan Edwards, written by Alexander V.G. Allen, is available here. Sereno Edwards Dwight’s biography can be found here. Samuel Hopkins’ biography can be found here. The Life of the Reverend Mr. Jonathan Edwards – pdf, 92 pp. [pdf epub mobi txt web via Internet Archive]. A series of sixteen sermons preached to his congregation at Northampton in 1738. Charity, or Love, the Sum of All Virtue (1 Corinthians 13:1–3) – pdf, 37 pp. Charity More Excellent Than the Extraordinary Gifts of the Spirit (1 Corinthians 13:1–2) – pdf, 35 pp. The Greatest Performances or Sufferings in Vain Without Charity (1 Corinthians 13:3) – pdf, 23 pp. Charity Disposes Us Meekly to Bear the Injuries Received From Others (1 Corinthians 13:4) – pdf, 43 pp. Charity Disposes Us to Do Good (1 Corinthians 13:4) – pdf, 22 pp. Charity Inconsistent With an Envious Spirit (1 Corinthians 13:4) – pdf, 24 pp. The Spirit of Charity is an Humble Spirit (1 Corinthians 13:4–5) – pdf, 41 pp. The Spirit of Charity the Opposite of a Selfish Spirit (1 Corinthians 13:5) – pdf, 42 pp. The Spirit of Charity the Opposite of an Angry or Wrathful Spirit (1 Corinthians 13:5) – pdf, 26 pp. The Spirit of Charity the Opposite of a Censorious Spirit (1 Corinthians 13:5) – pdf, 24 pp. All True Grace in the Heart Tends to Holy Practice in the Life (1 Corinthians 13:6) – pdf, 43 pp. Charity or a Christian Spirit Willing to Undergo All Sufferings in the Way of Duty (1 Corinthians 13:7) – pdf, 25 pp. All the Graces of Christianity Connected (1 Corinthians 13:7) – pdf, 24 pp. Charity, or True Grace, Not to Be Overthrown by Opposition (1 Corinthians 13:7) – pdf, 26 pp. The Holy Spirit Forever to Be Communicated to the Saints, in the Grace of Charity, or Divine Love (1 Corinthians 13:8) – pdf, 27 pp. Heaven, a World of Charity, or Love (1 Corinthians 13:8–10) – pdf, 68 pp. A Faithful Narrative of the Surprising Work of God in the Conversion of Many Hundred Souls in Northampton – pdf, 94 pp. Thoughts on Revival in New England – pdf, 295 pp. The Justice of God in the Damnation of Sinners (49 pages). A sermon on Romans 3:19. Joseph Bellamy: The Millenium. (Revelation 20:1-3) – pdf, 41 pp. Jonathan Edwards: An Humble Attempt to Promote Explicit Agreement and Visible Union of God’s People in Extraordinary Prayer for the Revival of Religion and the Advancement of Christ’s Kingdom. (Zechariah 8:20-22) – pdf, 269 pp. David Austin: The Downfall of Mystical Babylon. (Revelation 18:20) – pdf, 102 pp. Pressing into the Kingdom of God. A sermon on Luke 16:16. The Religious Affections – pdf, 381 pp. The Resolutions of Jonathan Edwards. A sermon on Deuteronomy 32:35. Also available as a Digital Puritan Press reprint here. God Glorified in Man’s Dependence (1 Corinthians 1:29-31) – pdf, 20 pp. A Divine and Supernatural Light (Matthew 16:17) – pdf, 24 pp. Ruth’s Resolution (Ruth 1:16) – pdf, 19 pp. The Many Mansions (John 14:2) – pdf, 14 pp. Sinners in the Hands of an Angry God (Deuteronomy 32:35) – pdf, 20 pp. Also available as a Digital Puritan Press reprint here. God’s Awful Judgment in the Breaking and Withering of the Strong Rods of a Community (Ezekiel 19:12) – pdf, 22 pp. A Farewell Sermon (2 Corinthians 1:14) – pdf, 36 pp. Treatise on Grace – pdf, 38 pp. Annotations on Passages of the Bible – pdf, 123 pp. Directions for Judging of Persons’ Experiences – pdf, 3 pp. Outlines on several sermons – pdf, 21 pp. Concerning the End for Which God Created the World – pdf, 115 pp. Desiring God has made a re-typeset edition of this available as an appendix to John Piper’s book, God’s Passion for His Glory. It can be found here. The Nature of True Virtue – pdf, 76 pp. Memoirs of the Late Reverend Jonathan Edwards, A.M. – pdf, 92 pp. A Farewell Sermon (2 Corinthians 1:14) – pdf, 40 pp. Result of a Council of Nine Churches – pdf, 3 pp. Regarding Jonathan Edwards’ expulsion from his church at Northampton. An Humble Inquiry Into the Rules of the Word of God Concerning the Qualifications Requisite to a Complete Standing and Full Communion in the Visible Christian Church – pdf, 190 pp. A treatise on qualifications for full communion. Misrepresentations Corrected, and Truth Vindicated – pdf, 178 pp. Edwards’ response to Mr. Williams’ published critique of An Humble Inquiry. The Work of Redemption – pdf, 385 pp. Dissertation on the Nature of Virtue – pdf, 78 pp. Observations Concerning the Mysteries of Scripture – pdf, 18 pp. A Narrative of Many Surprising Conversions – pdf, 75 pp. Thoughts on Revival of Religion in New England – pdf, 268 pp. An Humble Attempt to Promote Explicit Agreement and Visible Union of God’s People in Extraordinary Prayer for the Revival of Religion and the Advancement of the Christ’s Kingdom on Earth (Zechariah 8:20-22) – pdf, 141 pp. An Account of the Life of the Reverend David Brainerd, and Reflections Upon It – pdf, 52 pp. A Treatise Concerning Religious Affections (1 Peter 1:8) – pdf, 415 pp. Observations Concerning Faith – pdf, 73 pp. Reasons Against Dr. Watts’ Notion of the Pre-existence of Christ’s Human Soul – pdf, 6 pp. Inquiry into the Modern Prevailing Notions of Freedom of Will – pdf, 345 pp. Miscellaneous Observations Concerning the Divine Decrees in General and Election in Particular – pdf, 63 pp. Concerning Efficacious Grace – pdf, 92 pp. Dissertation Concerning the End for Which God Created the World – pdf, 117 pp. The Great Christian Doctrine of Original Sin Defended – pdf, 365 pp. Observations Upon Particular Passages of Scripture – pdf, 13 pp. Theological Questions – pdf, 4 pp. Justification by Faith Alone (Romans 4:5) – pdf, 122 pp. Joseph’s Great Temptation and Gracious Deliverance (Genesis 39:12) – pdf, 28 pp. Men Naturally God’s Enemies (Romans 5:10) – pdf, 49 pp. The True Christian’s Life, a Journey Towards Heaven (Hebrews 11:13-14) – pdf, 20 pp. True Grace Distinguished from the Experience of Devils (James 2:19) – pdf, 39 pp. The Excellency of Christ (Revelation 5:5-6) – pdf, 41 pp. Ruth’s Resolution (Ruth 1:16) – pdf, 18 pp. The Justice of God in the Damnation of Sinners (Romans 3:19) – pdf, 49 pp. The Future Punishment of the Wicked Unavoidable and Intolerable (Ezekiel 22:14) – pdf, 21 pp. The Eternity of Hell Torments (Matthew 25:46) – pdf, 216 pp. The Unreasonableness of Indetermination in Religion (1 Kings 18:21) – pdf, 16 pp. Unbelievers Condemn the Glory and Excellency of Christ (Acts 4:11) – pdf, 13 pp. The Folly in Looking Back in Fleeing out of Sodom (Luke 17:32) – pdf, 13 pp. God Glorified in Man’s Dependence (1 Corinthians 1:29-31) – pdf, 19 pp. Sinners in the Hands of an Angry God (Deuteronomy 32:35) – pdf, 17 pp. The Importance and Advantage of a Thorough Knowledge of Divine Truth (Hebrews 5:12) – pdf, 26 pp. God the Best Portion of the Christian (Psalm 73:25) – pdf, 15 pp. The Most High a Prayer Hearing God (Psalm 65:2) – pdf, 22 pp. Great Care Necessary, Lest We Live in Some Way of Sin (Psalm 139:23-24) – pdf, 49 pp. The Vain Self-Flatteries of the Sinner (Psalm 36:2) – pdf, 14 pp. Wicked Men Useful in Their Destruction Only (Ezekiel 15:2-4) – pdf, 24 pp. The Fearfulness Which Will Hereafter Surprise Sinners in Zion, Represented and Improved (Isaiah 33:14) – pdf, 25 pp. The Sin and Folly of Depending on Future Time (Proverbs 27:1) – pdf, 26 pp. Hypocrites Deficient in the Duty of Prayer (Job 27:10) – pdf, 26 pp. The Peace Which Christ Gives His True Followers (John 14:27) – pdf, 18 pp. The Perpetuity and Change of the Sabbath (1 Corinthians 16:1-2) – pdf, 42 pp. A Divine and Supernatural Light, Immediately Imparted to the Soul by the Spirit of God, Shown to be Both a Scriptural and Rational Doctrine (Matthew 16:17) – pdf, 23 pp. The Church’s Marriage to Her Sons, and to Her God (Isaiah 62:4-5) – pdf, 38 pp. The Excellency of a True Gospel Minister (John 5:35) – pdf, 24 pp. Christ, The Example of Ministers (John 13:15-16) – pdf, 21 pp. The Sorrows of the Bereaved Spread Before Jesus (Matthew 14:12) – pdf, 16 pp. True Saints, When Absent from the Body, are Present with the Lord (2 Corinthians 5:8) – pdf, 29 pp. God’s Awful Judgment in the Breaking and Withering of the Strong Rods of Community (Ezekiel 19:12) – pdf, 20 pp. The Nature and End of Excommunication (1 Corinthians 5:11) – pdf, 20 pp. The Sin of Theft and of Injustice (Exodus 20:15) – pdf, 26 pp. Types of the Messiah – pdf, 103 pp. Notes on the Bible – pdf, 452 pp. Memoirs of the Reverend David Brainerd – pdf, 493 pp. David Brainerd’s funeral sermon (2 Corinthians 5:8) – pdf, 30 pp. Want to discuss something pertaining to Jonathan Edwards? Leave a public comment below (subject to moderation), or send a private message to the webmaster. I have not read anything yet on Rev Edwards, but the just sampling The “Resolutions of Jonathan Edwards” and the article on “Self examination” made me ponder at my soul more deeply. Excellent stuff.